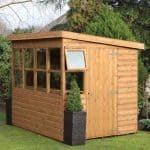 The 6×4 Treetops Traditional Pent Tool Store Shed is one of many sizes available in this impressive range. The security of the shed is outstanding, offering access via a key operated lock, rather than a simple hasp and staple or pad bolt. For some of the best 6×4 sheds currently on sale in the UK right now why not check out the 6×4 shed award winners. It is also one of the few tool sheds to offer a complete tongue and groove construction throughout. The walls do benefit from an additional Shiplap clad design, but the tongue and groove floor makes it suitable for all kinds of storage. 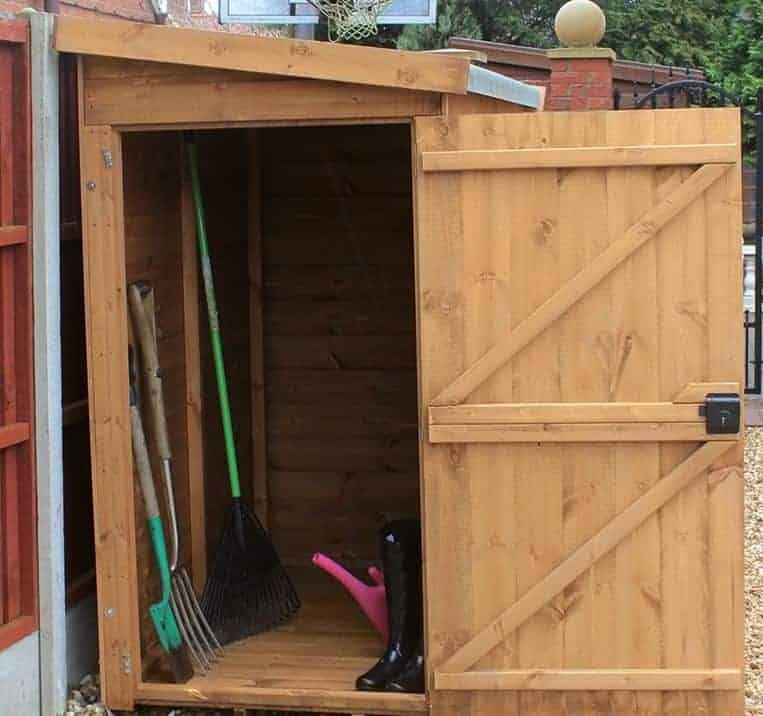 Obviously it isn’t a large shed, though it will easily store taller tools. The door height is shorter than the actual interior height so whilst you cannot walk into it, you can store taller items with ease. For security and privacy, the shed comes with a windowless design. Therefore we can recommend this for valuable storage. Though some great extras are available, you don’t have to spend a lot of extra money upgrading the building. This also adds to its impressive value for money. If you’re looking for a high quality storage space to store all of your important tools and equipment, this is a fantastic option. It is one of the best quality, value for money and most secure sheds on the market. The fact you also have numerous door choices is another great advantage. Isn’t suitable for a large amount of storage. However, it is ideal for small gardens and those who don’t have a lot of existing storage space available. The Treetops Traditional Tool Shed collection is available in a wide range of sizes. This is one of the most popular as it provides a generous amount of depth compared to other models. As you can see from the door height measurement, this isn’t a walk-in shed. Rather, everything is available within arm’s reach. It does benefit from a great spacious width however, covering almost the entire front of the shed. It is designed purely for use as a tool and small equipment storage space and comes with excellent built in security. One thing we really like about the Treetops Traditional Tool Shed collection is that the roof and floor benefit from the same strength as the tongue and groove clad walls. It has a pent design which basically makes it ideal for installing up against your home or in front of fences and other outdoor buildings. However, unlike most pent sheds, you’ll see from the picture this one has more of a reverse pent design. That means the roof slopes down to the side, rather than to the rear of the shed. It directs rainwater straight off the roof and prevents water build-up which could lead to rot. The toughness of the floor means you can literally store anything in here that will fit, regardless of its weight. It doesn’t need to be strengthened and it adds superb durability to the building. It’s unsurprising that this tool shed uses Shiplap tongue and groove cladding. At this price bracket it’s expected that a shed of such a compact size would come with a superior quality design. However, what is unexpected is the type of wood used. What sets it apart is the Deal redwood construction. This has a very sophisticated and attractive design. So along with the standard benefits of Shiplap and tongue and groove such as a water draining groove and an interlocking draft-proof design, you also benefit from a more stylish shed. 44mmx27mm framing provides a tough and incredibly stable support for the shed. 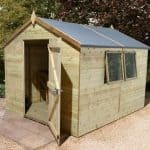 The fact it has been dip treated by the manufacturer is also advantageous as it means you won’t have to treat the shed again for up to 6 weeks after assembly. It is advised that you apply annual treatments after this however in order to ensure it maintains it high water-resistant benefits. The door featured on the front as shown in the picture already offers a unique design. However, the manufacturer also gives you the option to upgrade to a wider, double door option. This would leave both gables fully clad and would give the shed an even more unique design compared to other competitor tool sheds on the market. The double door will cost a little more, but you can also choose to stick to the single door and just move it to the opposite gable for free. Which style you go for, they all come with a fully braced, thick construction. They are also secured with a lock and key. 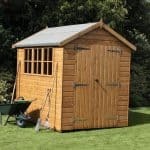 This is an excellent stand out feature as most sheds of this size, even in this price bracket, tend to just feature a pad bolt or hasp and staple. As security is one of the more prominent features of the shed, it doesn’t come with windows. This is by far one of the most secure sheds we’ve come across. The key operated lock is an extremely good feature and really sets it apart from other similar buildings. You won’t have to worry about anybody else gaining access and you don’t need to pay for any additional security. The thickly clad walls are also secure, while the windowless design completes the overall tough, secure and private design of the shed. You are given a couple of unique customisation options with this tool shed. The first is the type and placement of the door. 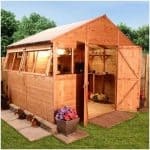 Included with the purchase price, the shed comes with a single, well braced, tough and sturdy door. There are two placement options including as it is shown in the picture and on the opposite gable to the one shown. However, that’s not all. There is also a third option. Double doors can be fitted instead of a single door and they will be installed in the same place as the single door on the photo. There’s no real practical benefits of the double doors over the single option, but they do present a slightly different appearance. So it’s all down to your own personal preferences. The other unique extra is the floor bearers. These again are shown in the picture, but they do not come with the shed as standard. We would definitely advise you to buy these bearers as they help to lengthen the floors lifespan and protect it against damp during heavy downpours. The last extra which personally we think you don’t need is the Garden Building Installation service. This may not be the smallest model in the range, but it’s definitely not a huge building. Therefore assembling it is actually very straightforward. We’d suggest saving your money and putting it together yourself. 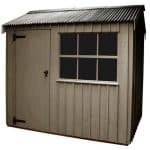 The quality of the Treetops Traditional Pent Tool Store Shed range is exceptional. Every last little detail has been created to the highest standard. You won’t find a better quality tool shed anywhere else for the same price. The shed is designed to last a very long time and this is highlighted by the incredibly strong materials used. Although it does need to be treated annually, we still feel it deserves maximum rating for longevity compared to other competitor sheds out there. As this is one of the larger models in the range, it does offer slightly more depth than the others. However, you do need to remember that this is by no means a large building. It is designed purely to store essential gardening tools though thanks to its security you can store valuable equipment in here too. Although you could save time and stress with the Garden building installation service, the shed itself is very easy to install. Therefore we’d recommend saving your money and assembling it by yourself. It comes with all fittings and fixtures required and as there aren’t any windows, the installation is very straight forward. 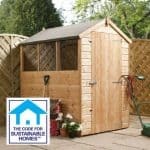 Thanks it its unique design and excellent array of features, this tool shed offers sensational value for money. It’s guaranteed to last for many years and is one of the most secure and high quality tool sheds available. Final Thoughts: This is a truly exceptional tool shed and it comes as part of the popular Treetops Traditional tool store shed collection. There are a lot of different sizes and the 6x4 is by far one of the most popular. It offers a good level of space and more importantly, the floor is constructed from high quality tongue and groove cladding. This means even heavyweight tools are easy to store. With a key operated lock and windowless design, your tools are guaranteed to be kept not only 100% safe, but thanks to its weatherproof qualities they will also remain dry all year round.